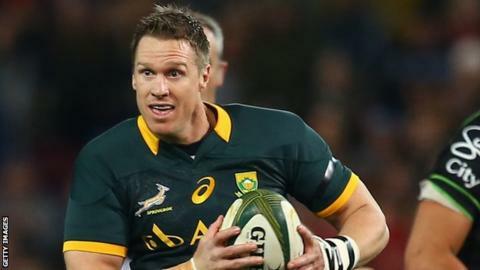 South Africa captain Jean de Villiers will be out for at least four weeks with a fractured jaw he sustained in his side's 37-25 defeat by Argentina. It leaves the 34-year-old centre in a race to be fit for the World Cup in England, which starts in September. He has just spent eight months on the sidelines after suffering a serious knee injury against Wales in November. De Villiers, who has 107 caps, is expected to retire from international duty after the World Cup. South Africa start their campaign against Japan in Brighton on 19 September, before other Pool B games against Samoa, Scotland and USA.